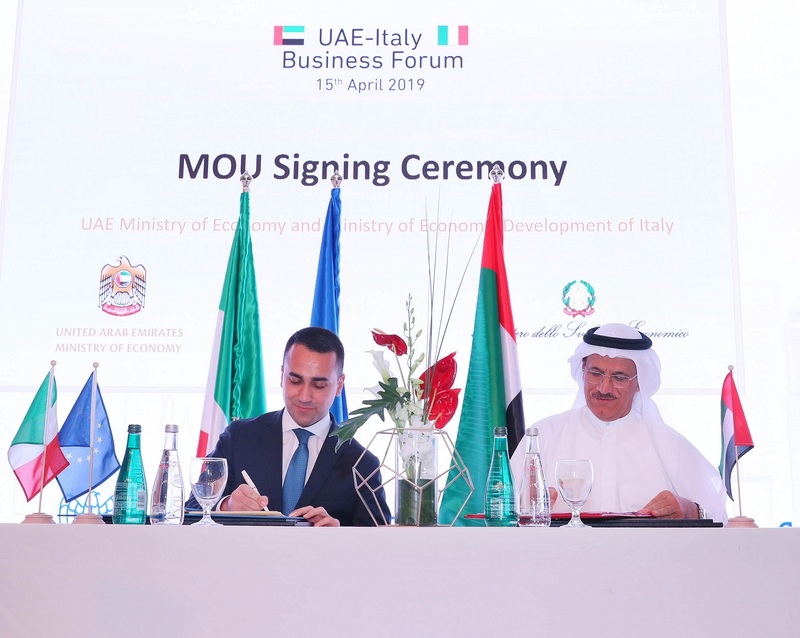 DUBAI, 15th April, 2019 (WAM) -- The UAE- Italy non-oil trade exchange amounted to US$7.8 billion in 2017 and exceeded $5.7 bn during the first nine months of 2018, according to Sultan bin Saeed Al Mansouri, Minister of Economy. The minister said this while delivering the inaugural remarks of the Italy-UAE Business Forum which opened today in Dubai in the presence of Luigi Di Maio, Deputy Prime Minister and Minister of Economic Development of Italy. The two ministers signed a Memorandum of Understanding, MoU, in the field of innovation, small and medium-sized enterprises, SMEs, and startups. They also attended the signing of another MoU between the Etihad Credit Insurance and joint Italian-Arab Chamber of Commerce on circular economy. The two MoUs are a step forward on the path towards consolidating cooperation across the sectors outlined by the UAE National Innovation Strategy, namely renewables, transportation, water, education, health and space in addition to other primary sectors prioritised by the Italian side, namely mechanic engineering, FinTech, biotechnology, and medical industry. The Italy-UAE Business Forum features panel discussions taking place simultaneously on Infrastructure, Energy, Water and Environment and ITC. It's looking at fresh prospects to cement bilateral trade relations and support the growth and development of the UAE. "The UAE is Italy's largest Arab trade partner and the European country is the UAE's fourth-largest European partner and second largest exporter in Europe, according to the 2017 statistics," Al Mansouri added, noting that UAE exports to Italy grew 7.7 percent during the first nine months of 2018 as compared to the corresponding period in 2017. For his part, Di Maio underlined Italy's determination to beef up partnership ties with the UAE, not only in the trade sphere, but also to advance cooperation across all fronts. "The UAE boasts a strong economy and robust investment potential and we are keen to widen the scope of cooperation in areas like renewable energy, infrastructure, real estate investment, as well as innovation," he added. For his part, Hamid Mohammed Bin Salem, Secretary-General, Federation of UAE Chambers of Commerce and Industry, pointed out that the forum reflects the desire of officials and business owners from the two countries to promote joint cooperation and discuss opportunities and areas of partnership in light of the strong bilateral and economic relations between UAE and Italy. 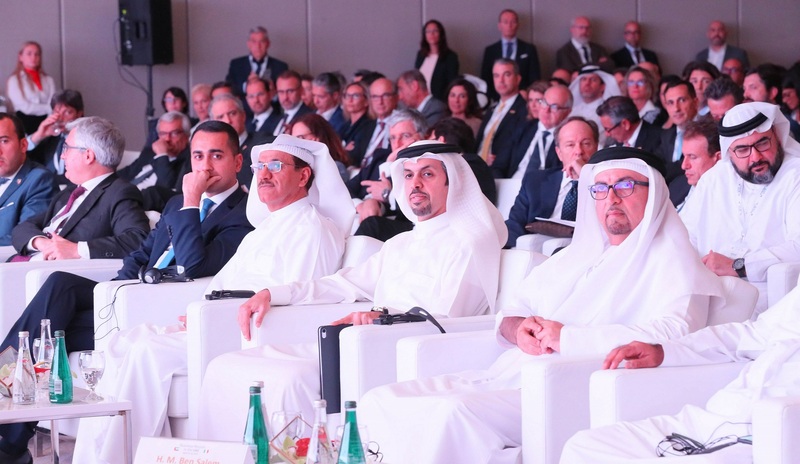 Addressing the forum, Hamad Buamim, President and CEO, Dubai Chamber, said that the UAE and Italy share a strong economic relationship, adding that this forum is an exceptional opportunity to develop and enhance the countries’ bilateral ties. He noted that the Italian Business Council, which operates under the umbrella of the Chamber, plays an integral part in supporting the economic relations between the two business communities. Buamim revealed that non-oil trade between Dubai and Italy has increased steadily in recent years reaching around AED 24 billion in 2018, with a growth of 6.6 percent as compared to 2017. He added that Italy ranked 17th place in Dubai’s top list of trading partners in 2018. He noted that Expo 2020 Dubai will present lots of opportunities for mutual cooperation, specifically in key sectors including energy, water, information technology, infrastructure and innovation. Speakers at the Forum included Marwan Al Sarkal, CEO, Sharjah Investment and Development Authority (Shurooq) and Mouza Obeid AlNaseri, Acting CEO, Khalifa Fund for Enterprise Development- Abu Dhabi. They affirmed the importance of the forum in the move to exchange expertise, knowledge transfer, trade and investment development between the UAE and Italy, especially across many of the priorities of the economic agendas of both countries.